This was our first wedding at The Peak Edge Hotel in Derbyshire. This must be one of the best bridal suits we have been in, it is large, spacious and comfortable and has a fantastic view out of the front of the hotel so the bridal party can keep and eye on the comings and goings as they get ready without being noticed! It is also a wonderful wedding venue in North East Derbyshire, surprisingly close to Chesterfield but also convenient for Sheffield and further afield too. The grounds like the hotel are beautiful and improving all the time as they settle in and mature, a lovely place for a wedding and a lovely place for us to do our work. 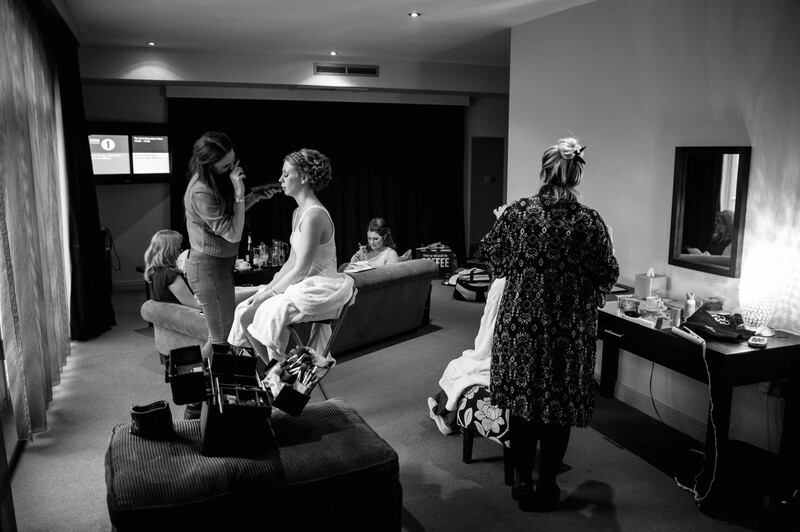 In this photo there is the usual intense activity for the hair and makeup artists as they get our bride, her bridesmaids and the mother of the bride ready for the big event. These are always must have images from a wedding day as they help to build the story of the day and the fun, laughter and sometimes tears can be forgotten as the rest of the events of the day unfold. They are though an important aspect of a wedding day and we through our images help you remember and relive your whole day for the weeks, months and years afterwards. Wedding photography is not just about the wedding day but is an investment in your future allowing you and your descendants to look back and remember with fondness your wedding day in the future.